I just purchased and installed Reflector Pro yesterday, and I'm considering requesting a refund given how frustrating this is. However, I occasionally need to the 3rd party assembly debugging feature, and for now Reflector is still the only option (that I know of). Here's the issue: I have other add-ins that I'm VERY happy with that already handle "Go to Definition" and other functionality in VS. The Reflector Add-in is "fighting" for supremacy with my other add-ins though, and now basic functions like "Go to Definition" are pretty broken. 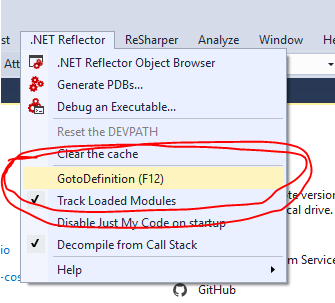 I understand that Reflector probably needs to override those to allow "Go to Definition" to work for pulling up the code for 3rd party assemblies it has decompiled, etc. So, I understand that there are times when I would want to opt-in to let Reflector have the wheel. The goal is to allow me, the developer, the driver, to decide where the car goes. It is extremely frustrating when my Add-ins are fighting me. Additionally, I would love to see Reflector add its own "Reflector ->" sub-menu with "Code Browsing" commands added to the code editor. That would allow me to disable the global handlers, but manually invoke them via a right click opt-in any time I want. E.g. I could right-click a 3rd party method and choose "Reflector->Go To Definition", etc., and be sure that I'm looking at the debuggable code. FWIW, I've submitted a refund request as a support ticket. The Add-In was the only reason for my purchase, and it is essentially unusable in its current form. What a shame. The only way I can get work done is to disable the Add-In, which kind of ruins the point of having it in the first place. I opted to go straight for the purchase without doing a trial. So that's my fault. I would've noticed these issues immediately if I had done a trial version before purchasing. @livingagile its probably too late for your case now so apologies that this didn't work out for you. I've entered a enhancement request for this though as I agree its something we should be reasonably handling. No worries. I love the product otherwise, and will happily purchase again if I can "hot" enable/disable the navigation features (without having to disable/enable the entire plugin via VS Extensions menu and restarting VS). The menu option that's already there seems like it should cover ALL aspects of the navigation hooks. I can't promise anything, but I agree personally so have taken it to the team. I will update you when we've had a bit more time to discuss it.